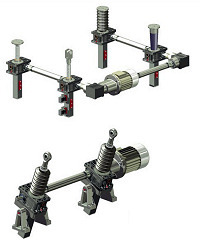 Screw jack systems are used in automated production plants worldwide. ZIMM systems are not only for the simple stock lifting from a few kilograms to 100 tonnes, but also responsible for movements in all directions. Excavators work with hydraulics, light weights can be moved fast pneumatically - screw jack technology comes into play, where loads need to be controlled and positioned precisely. 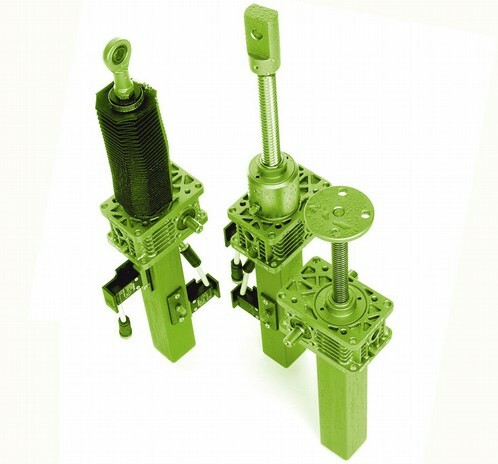 With the "Screw Jack Building Block System", ZIMM offers a versatile program for the electromechanical adjustment of linear movements. Designers and engineers find ideas and solutions for lifting loads from 0.25 kN to 1000 kN with our modular system. There are numerous applications, for example, theatre and stage construction, plants for the production of sheet steel and steel pipes, wood working machines, plastics processing machines, textile machines, assembly equipment in the automobile and aircraft industries, food and beverage production equipment as well as packaging machines. The customer benefits from the extensive product range and solutions from one source and receives complete assemblies, as agreed or requested. This saves time in design, purchasing and assembly. The Z series with its special corrosion resistance coating 'as standard' yet at similar price to our MSZ series. Our standard design can be used universally where corrosion resistance is not a requirement of the application. For the screw jack system ZIMM offers a complete programme together with an extensive range of system accesories.